"Handmade snacks have a place on all To Go shelves"
Sapros GmbH, headquartered in Ilsfeld, on the 7th of March launched a new product line for the To Go market. Labeled SalatCup, there is now a line of salad mixes in four different variations. The expansion of the convenience range goes hand in hand with the growing demand for healthy snacks in appropriate units and packaging, says the company's management. The salad cups are initially available in four different flavors: Chicken To Go, Chef To Go, Veggie To Go and Thuna To Go. The basic ingredients of each blend are fresh endive and radicchio, fine cabbage, cooked corn kernels, cucumbers, cocktail tomatoes, red pepper cubes and carrots. The salad cups are rounded off with a suitable yoghurt dressing (80 ml). In line with the convenience trend, the salads are offered in smaller units (245 g), which makes them ideal as a snack. The salads are freshly prepared daily in the production facility of Sapros GmbH in Ilsfeld. Further advantages of the product line are the long shelf life and the eye-catching, high-quality packaging design, which is rounded off with a banderole made of recycled paper, says Marketing Manager Bjoern Berger. "We believe that our salad cups can be placed on all To Go shelves. Because a fresh, healthy, handmade snack is very exciting and lucrative for all providers in the convenience sector." 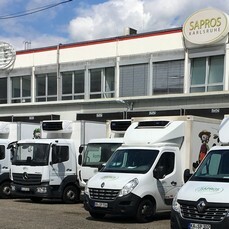 Sapros GmbH has long been exploring the possibilities of the convenience business. The existing and proven range has already been extended with antipasti and numero us kitchen-ready products, mainly from our own production. The company will continue to focus on the further development of this modern product segment in the future. Berger: "The trend for healthy snacks is unrestrained and, in our opinion, will continue to influence consumer behavior. Thanks to our IFS certification, we can still respond comprehensively to the increasing quality requirements of our customers. "